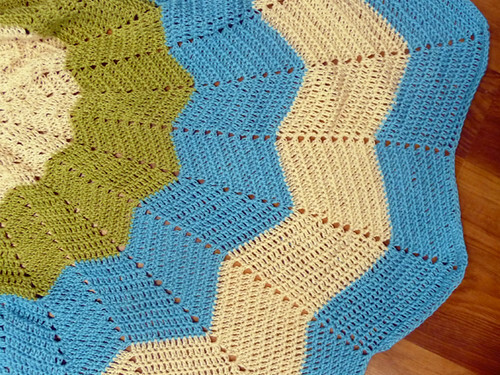 Last week I also finished my my Round Ripple Baby Afghan. I meant to take pictures as I went, or mention that I’d started it, but that didn’t happen. I really like this pattern– the starburst effect is fun, effortless, and since it’s done in the round there was no dreaded foundation chain. Plus you can use it with pretty much any yarn, which makes it a great stash-buster. I made this one in order to use up a stash of Red Heart Lustersheen that keeps getting fed by various freelance projects, and it worked out pretty well. I used a size G (4.0 mm) hook and about 5 skeins of lustersheen (1 green, 2 turquoise, 2 white, with a bit to spare). I have some purple, green and brown that go well together still left in the stash so you can bet I’ll be making a second one soon. I like the weight of these blankets because they’re not super heavy, but this would be fun in a worsted weight, too. This is gorgeous! I love crocheted and knitted blankets (and other items) but I am not really good at it. I am better at crochet than knitting, but I stick to making small items. I often buy magazines just because the patterns are so nice, even if i know I will never make it! Love the colours! 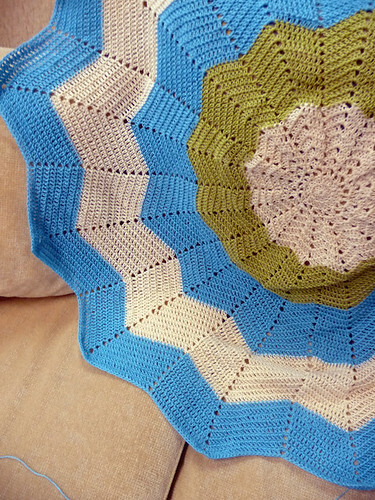 I didn't realise there was a crochet version of this blanket. Thanks for sharing the link!